Our staff are dedicated and enthusiastic, with up-to-date skills and qualifications. All of them are qualified first aiders and have been fully DBS checked. We provide time and space for knowledge sharing, and support for continuous professional development for all our staff. Goudhurst Village Pre-school is a member of the Pre-school Learning Alliance and we ensure that we keep up-to-date with best practice in early years care and education. Our ratio of adults to children in our pre-school sessions is at least one adult to four children for under threes, and at least one adult to eight children for over threes. This helps us to give time and attention to each child – talking and listening to them and helping them to get the best out of the experiences and activities we provide. We work in partnership with parents to share information and involve them in their child’s continuous learning and development in a variety of ways. Our Manager, Mrs. Jo Galloway, is ultimately responsible for each child’s care, development and emotional support. 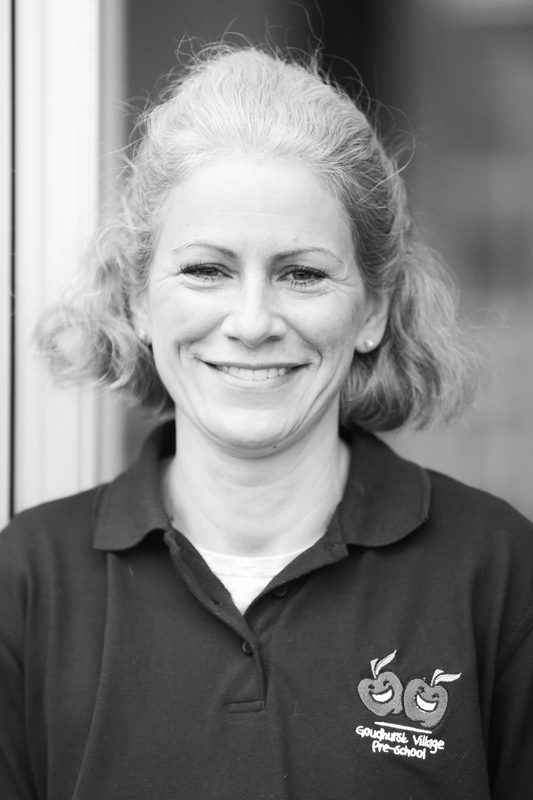 Each key person reports to her and she is in charge of child protection, health and safety, food and hygiene, all risk assessments, curriculum planning, first aid and overseeing premises evacuation and fire procedures. Jo has a Diploma in Pre-school Practice Level 3 and is in the process of updating her SENCO qualifications and undertaking a management training course. 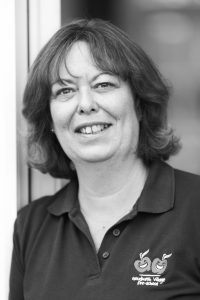 She has completed Pre-School Learning Alliance training in Child Protection, Basic Food & Hygiene and Delivering the Revised Early Years Foundation Stage as well as the KCC Child Protection course. 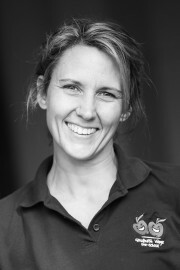 Jo’s experience of running successful pre-schools has been in Kilndown for five years 1994 – 1999 where she initially trained, and in Goudhurst for six years from 2000 – 2006. She has run a children’s play centre, been a nanny, and babysits for local people. She has two grown-up children who like herself have lived in Goudhurst Village all their lives. Our Good In All Areas Ofsted report – the best we could attain as a newly opened setting back in 2014 after only 4 months of opening – is testament to her ability to put her years of experience and knowledge expertly into practice within a short space of time and pull together a genuinely happy team. 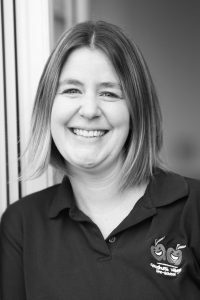 Our Deputy Manager, Sam Thompson, has nine years’ experience of pre-school practice at Stepping Stones in Paddock Wood and more recently at Rainbow Pre-school in Cranbrook. She has a Level 4 BTEC National Diploma in Nursery Nursing, is SENCO qualified and has recently attained a certificate of Higher Education from the Open University and now has Early Years Professional Status. 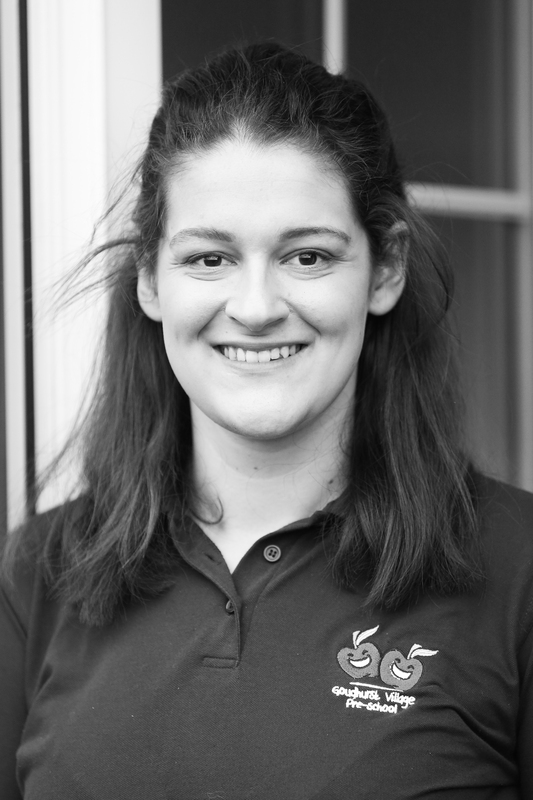 Sam also has experience as a Teaching Assistant in a Year 1 classroom and has four daughters of her own. She started with us when we opened in January 2014. Samantha Metson-Jeffery joined us in September 2016. She is Canadian and lives in Kilndown with her family that includes three boys and her step daughter. After forging a career in the UK for nearly 2 years she started volunteering for us when her son was an attendee and is now a permanent member of staff with a real team mentality and loads of energy. Sam is already well versed in special needs care and language development and trained in Pediatric First Aid and Makaton for beginners. She is studying for her Level 3 NVQ with us and has been named Early Years Care Apprentice of the Year 2017 at the national Lifetime Training awards. Kat is Level 3 NVQ qualified and an ex-childminder who lives in Goudhurst and is now updating her qualifications whilst being part of the Happy Apples team. She has considerable experience working with all ages of children but is keen to get back to the Early Years age group and do what she loves best now her daughter has started primary school. Mary-Jane Meekham, our new apprentice since September will be studying for her Level 3 NVQ with us. She enjoyed a stint of work experience when younger at Sandhurst Nursery that ignited her interest in Early Years and has a 7-year old younger sister and three younger cousins all of whom she has enjoyed helping develop and having fun with.